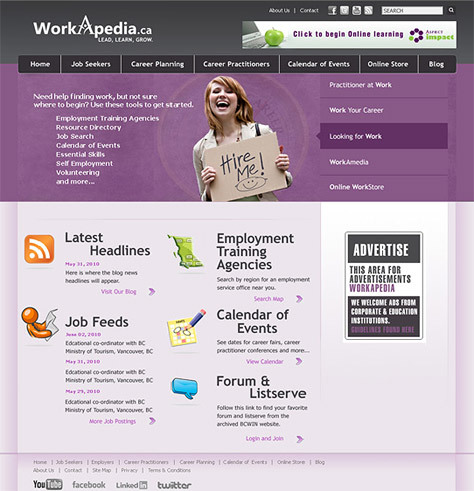 Workapedia formerly known as Workinfonet.bc.ca was over 10 years old, and was acting as a portal website with thousands of external links. A brand new design, consolidated webpages, job feeds, calendar of events, searchable map of service providers, and a banner advertisement system are just a few of the features that zipped this older site into an easy, manageable website. Staff can change navigation and pages to their hearts content with the easy Wordpress CMS system.